Connect your Bluetooth accessories with a simple tap: one of the most convenient use cases of NFC. But what if your Bluetooth gadget doesn’t integrate NFC? You can now create Bluetooth handover tags with the new NFC interactor 7! The new release fully integrates support for parsing NFC tags in existing accessories like headsets, printers or loudspeakers. These can also be cloned, edited or created from scratch – either using the low level editor, or the convenient Bluetooth Wizard. The relevant specification documents that are relevant for the new app version total 2,753 pages (Bluetooth 4.1 Core Specifation, NFC Forum Connection Handover 1.3). The multitude of scenarios and Bluetooth features require a huge amount of flexibility in the app to correctly represent all options in a user friendly way. NFC interactor 7 is the world’s first app that allows advanced users to create standard-conforming Bluetooth NFC tags through an easy to use interface, while at the same time offering access to every single configuration detail possible. Thousands of combinations are possible, and it’s easy to save your NFC tag composition for later re-use. To make the full world of Bluetooth more accessible, we have additionally integrated a Bluetooth Wizard. To create an NFC tag, simply select one of your previously paired Bluetooth devices – NFC interactor automatically retrieves the device address and name. Optionally, you can then choose the device class (loudspeaker, smartphone, etc) from relevant presets. 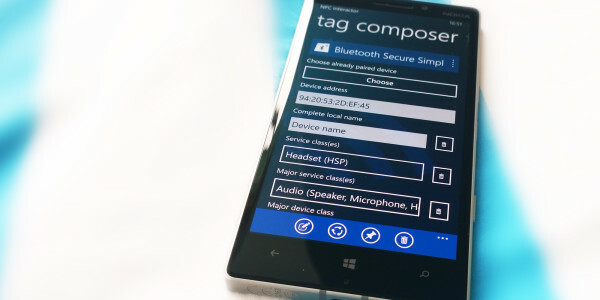 That’s it, your Bluetooth Connection NFC-Tag is ready to use! We have updated the record parsing display to make the tag reading analysis results easier to understand – especially important for complex records like for Bluetooth. In addition, NFC interactor 7 supports 9 new Windows Phone 8.1 settings launch options – including the battery saver, proximity or the notifications & actions center settings. The new version of NFC interactor 7 is available immediately. If you have previously purchased the app, it is a free update – your phone will notify you automatically. The C# version of the NFC / NDEF library has just been updated to version 3.0.2. This release has received a lot of additional testing and a few more tweaks, making it fit for use in business-scale applications. We have spent a large amount of time testing and validating the immensly complex new Bluetooth functionality that was introduced in the NFC / NDEF library version 3.0. The good news: we did not find any issues in the code. The even better news: based on working with the code, we have identified a few tweaks that make the library even easier to use. These have now been implemented in the new version 3.0.2. The new version of the library is available for download right away. In your existing or new C# projects, just let Visual Studio download the NuGet package. Thanks again to netidee for supporting the library development! With growing support and capabilities for HTML5 apps on all desktop and mobile platforms, we want to ensure the compatibility to avoid fragmented ecosystems. As a user, you want your NFC-based service to work, regardless of the manufacturer or developer. The source code of the library is available via GitHub. For the build system, we are using Node.JS in combination with Grunt – a step by step guide for the setup is included in the readme file, in case you need to modify the library and build it yourself. Over the past few months, the NFC library has seen tremendous progress. Now, the next major release is here: the new 3.0.1 version is now available for download and adds Blueooth, Connection Handover and Windows Phone 8.1 / Universal Apps support! Bluetooth Secure Simple Pairing: based on the “Bluetooth Secure Simple Pairing Using NFC” Application Document of the NFC Forum, as well as the latest Bluetooth Core 4.1 specification by the Bluetooth SIG. NDEF records created based on this class are sufficient to do a connection handover: tap an NFC tag and connect to any Bluetooth device! The record can provide a multitude of information to the reading device, such as the service class, major and minor device class, name of the device and much more. In addition, the library package definition has been updated to include full support for Windows Phone 8.1 and Universal apps, so that you can continue using the library directly from the NuGet package and without having to download the source code. You can get the source code plus the demo app from the library homepage on Codeplex. Alternatively, you can directly integrate the library into your project through NuGet – make sure you enable the setting “Include Prerelease” to install the latest version 3.0! NDEF Library got another supporter with the uNFC library for the Windows embedded platform. The uNFC library allows to use NFC integrated circuits connected to your PC (via serial) or to an embedded system based on Windows Embedded Compact or the .Net Micro Framework. The Library supports the NXP PN532 transceiver module for contactless communication – one of the most popular NFC chipsets and embedded in countless phones and devices. It’s good to see that additional solutions and developments are accelerating thanks to our NFC library. We are excited to see additional services being created that utilize the library. As a small incremental update release, the latest version of NFC interactor 6.2 is now available for download in the Windows Phone Store! The main new feature is that the live tile of the app now supports the large size, and it shows the message currently saved in the composer on the back side of the tile. In addition to small bug fixes, the new release also updates references from Nokia Music to Nokia MixRadio, as the service was recently renamed. The Nokia Create Contest included missions that challenged developers to improve their apps with specific features that are especially powerful on Windows Phone devices. We took the challenge and deeply integrated HERE maps into our latest big NFC interactor 6 update. There are 10 winning apps per category – and we’re happy to announce that Nokia selected NFC interactor as one of them! 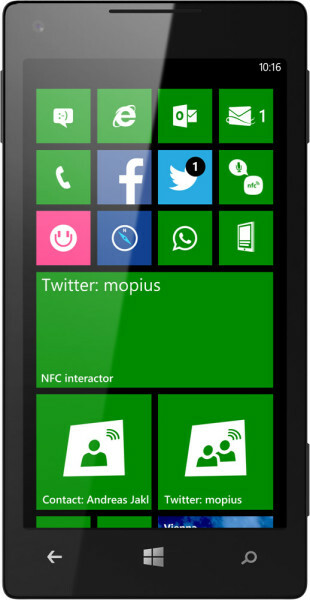 A small maintenance update of NFC interactor is now available in the Windows Phone 8 store. In addition to the screen orientation lock setting option that was added in the previous NFC interactor 6.0 release, the new version now adds the second new GDR 3+ system setting to go straight to the phone’s power options. In addition, thanks to bug reports submitted users of the professional version, we were able to identify and fix a bug that caused a crash when the optional buttons in the record headers were activated for interaction within the composer. As usual, the new version is available as a free update to all existing users and can be downloaded from the store right away.